Octane license already in use on my own computer? Forums: Octane license already in use on my own computer? This is the second time I have had this issue, and I don't want to keep using my unlocks from the site. But I am getting this error. 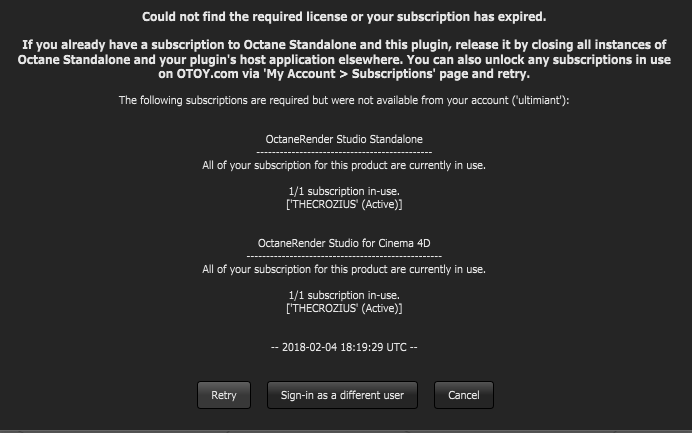 I have only used Octane on this computer, and I cannot deactivate the license because I cannot log in, I have no way of releasing my license unless through the website. Any ideas on how to fix this? The first time it happened I believe my computer crashed, but why is my license not picking up that I am on the same computer? Re: Octane license already in use on my own computer? Octane License is released (deactivated) when the application is closed. In the case of Octane Standalone edition just the standalone license is released, while plug-ins will release both Standalone and their respective license. In either case, licenses are just released if there is not another instance of Octane V3 Standalone or a plug-in making use of that specific license. If you have had an operating system upgrade, security system upgrade of replaced certain hardware on machine that changes your machine address, OTOY recommend that you use an UNLOCK to deactivate the license. The unlocks will reset back to 5 periodically, providing they are only occasionally used. detailed explanations about Octane V3 licenses. Alright, so I am using the plugin version, and the last time I used Cinema 4D I closed the application normally which should have released the license. But Now I have just attempted to start Octane again and Octane is saying it is already in use, why is my license not being released the way it should? The octane website is saying that the license is currently activated on my computer, should it not have deactivated? I had no crashes or changes in hardware/the C4D plugin, and I have not used the "use offline" option. please, contact the Otoy support service to resolve your issue, by sharing your account details in a confidential way. As a data point: We were having a problem like this last week, where one of our licenses wasn't releasing when C4D was quit. We had to manually go to C4D Octane Settings/Settings/Account and Sign Out, then quit the app and rebooted the machine. After doing that, the license is properly getting released again on quitting C4D or Stand Alone. frankmci wrote: As a data point: We were having a problem like this last week, where one of our licenses wasn't releasing when C4D was quit. We had to manually go to C4D Octane Settings/Settings/Account and Sign Out, then quit the app and rebooted the machine. After doing that, the license is properly getting released again on quitting C4D or Stand Alone. Check it without my other plugins. TFD was causing hold on exit.